The team at Macfarlane Clinic are dedicated to helping your family grow from babies into healthy children and ultimately healthy adults. 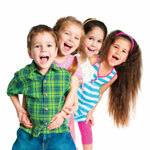 What is the osteopathic approach to treating children? Children with chronic conditions, other physical impairments, or difficulties relating to their growth, development, posture or movement.